Fig. 1. コントロール群とアロニア果汁摂取群の体重と血糖値の違い(A)	体重　(B) 血糖値　3 – 4日おきに28日間測定した。 KK-Ayのコントロール群とアロニア果汁摂取群で 顕著に異なる。 *p<0.05、**p<0.01、n=5. Fig. 3. 血清、肝臓、小腸におけるDPP IV活性 (A)	血清、(B) 肝臓、(C) 小腸 *p<0.05、**p<0.01、n.s.:有意でない、n=5. Fig.4 小腸上部におけるアロニア果汁のα‐グルコシダーゼ阻害効果と小腸におけるGIPおよびGLP-1の発現レベル アロニア果汁にはα‐グルコシダーゼ阻害効果がある。(B) 小腸上部と下部におけるα‐グルコシダーゼ阻害効果　(C) GIP発現レベル　(D)GLP-1発現レベル　*p<0.05、**p<0.01、n.s.:有意でない、n=5. Kokotkiewicz A, Jaremicz Z, Luczkiewicz M. Aronia plants: a review of traditional use, biological activities, and perspectives for modern medicine. J Med Food 2010; 13:255-69. Wu X, Gu L, Prior RL, McKay S. Characterization of anthocyaninsand proanthocyanidins in some cultivars of Ribes, Aronia, and Sambucus and their antioxidant capacity. J Agric Food Chem 2004; 52:7846-56. Wu X, Beecher GR, Holden JM, Haytowitz DB, Gebhardt SE, Prior RL. Concentrations of anthocyanins in common foods in the United States and estimation of normal consumption. J Agric Food Chem 2006; 54:4069-75. Kulling ES, Rawel MH. Chokeberry (Aronia melanocarpa) –A Review on the Characteristic Components and Potential Health Effects.Planta Med. 2008; 74:1625-34. Badescu M, Badulescu O, Badescu L, Ciocoiu M. Effects of Sambucus nigra and Aronia melanocarpa extracts on immune system disorders within diabetes mellitus. Pharm Biol. 2015; 53:533-9. 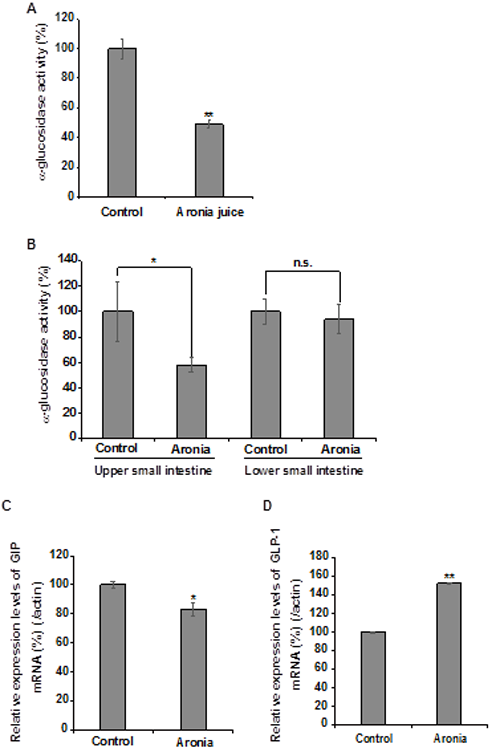 Valcheva-Kuzmanova S, Kuzmanov K, Tancheva S, Belcheva A. Hypoglycemic and hypolipidemic effects of Aronia melanocarpa fruit juice in streptozotocin-induced diabetic rats. Methods Find Exp Clin Pharmacol. 2007; 29:101-5. Simeonov SB, Botushanov NP, Karahanian EB, Pavlova MB, Husianitis HK, Troev DM. 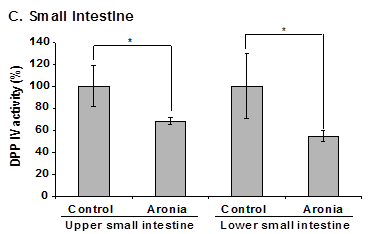 Effects of Aronia melanocarpa juice as part of the dietary regimen in patients with diabetes mellitus. Folia Med (Plovdiv) 2002; 44:20-3. 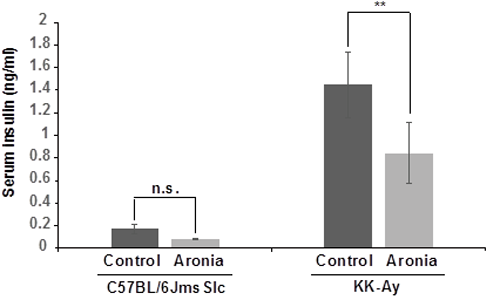 Zielinska-Przyjemska M, Olejnik A, Dobrowolska-Zachwieja A, Grajek W. Effects of Aronia melancarpa polyphenols on oxidative metabolism and apoptosis of neutrophils from obese and non-obese individuals. Acta Sci Pol Technol Aliment 2007; 6:75–87. Kozuka M, Yamane T, Nakano Y, Nakagaki T, Ohkubo I, Ariga H. Identification and characterization of a dipeptidyl peptidase IV inhibitor from aronia juice.Biochem Biophys Res Commun. 2015; 465:433-6. Ohkubo I, Huang K, Ochiai Y, Takagaki M, Kani K. Dipeptidyl peptidase IV from porcine seminal plasma: purification, characterization, and N-terminal amino acid sequence. J Biochem. 1994; 116:1182-6. Kieffer TJ, McIntosh CHS, Pederson RA. Degradationof glucose-dependent insulinotropic polypeptide andtruncated glucagon-like peptide 1 in vitro and in vivo bydipeptidyl peptidase IV. Endocrinology 1995; 136:3585-96. Pridal L, Deacon CF, Kirk O, Christensen JV, Carr RD, Holst JJ. Glucagon-like peptide-1(7-37) has a larger volumeof distribution than glucagon-like peptide-1(7-36) amide in dogsand is degraded more quickly in vitro by dog plasma. EuropeanJournal of Drug Metabolism and Pharmacokinetics 1996; 21:51-9. Mentlein R. Dipeptidyl-peptidase IV (CD26)--role in the inactivation of regulatory peptides. Regul Pept. 1999; 85:9-24. Baggio LL, Drucker DJ. Biology of incretins: GLP-1 andGIP. Gastroenterology 2007; 132:2131-57. Zhong J, Gong Q, Goud A, Srinivasamaharaj S, Rajagopalan S. Recent Advances in Dipeptidyl-Peptidase-4 Inhibition Therapy: Lessons from the Bench and Clinical Trials. J Diabetes Res. 2015; 2015:606031. Ríos JL, Francini F, Schinella GR. Natural Products for the Treatment of Type 2 Diabetes Mellitus. Planta Med. 2015; 81:975-94. Cho HJ, Kosari S, Hunne B, Callaghan B, Rivera LR, Bravo DM, Furness JB. 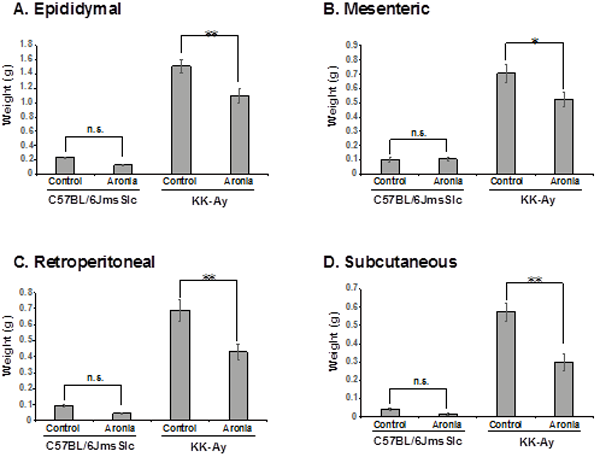 Differences in hormone localisation patterns of K and L type enteroendocrine cells in the mouse and pig small intestine and colon. Cell Tissue Res. 2015; 359:693-8. Narita T, Katsuura Y, Sato T, Hosoba M, Fujita H,Morii T, Yamada Y. Miglitol induces prolonged and enhancedglucagon-like peptide-1 and reduced gastricinhibitory polypeptide responses afteringestion of a mixed meal in Japanese Type 2diabetic patients. Diabetic Med.2009; 26:187-93. Miyawaki K, Yamada Y, Ban N, Ihara Y, Tsukiyama K, Zhou H, Fujimoto S, Oku A, Tsuda K, Toyokuni S, Hiai H, Mizunoya W, Fushiki T, Holst JJ, Makino M, Tashita A, Kobara Y, Tsubamoto Y, Jinnouchi T, Jomori T, Seino Y. Inhibition of gastric inhibitory polypeptide signaling prevents obesity. Nat Med. 2002; 8:738-42. Imai C, Saito M, Mochizuki K, Fuchigami M, Goda T, Osonoi T. Cotreatment with the α-glucosidase inhibitor miglitol and DPP-4 inhibitor sitagliptin improves glycemic control and reduces the expressions of CVD risk factors in type 2 diabetic Japanese patients. Metabolism. 2014; 63:746-53. Ni Z, Anini Y, Fang X, Mills G, Brubaker PL, Jin T. Transcriptional activation of the proglucagon gene by lithium and beta-catenin in intestinal endocrine L cells. J Biol Chem. 2003; 2:1380-87. Jang WS, Seo CR, Jang HH, Song NJ, Kim JK, Ahn JY, Han J, Seo WD, Lee YM, Park KW. Black rice (Oryza sativa L.) extracts induce osteoblast differentiation and protect against bone loss in ovariectomized rats.Food Funct. 2015; 6:265-75. Gevrey JC, Malapel M, Philippe J, Mithieux G, Chayvialle JA, Abello J, Cordier-Bussat M.Protein hydrolysates stimulate proglucagon gene transcription in intestinal endocrine cells via two elements related to cyclic AMP response element.Diabetologia. 2004; 47:926-36. 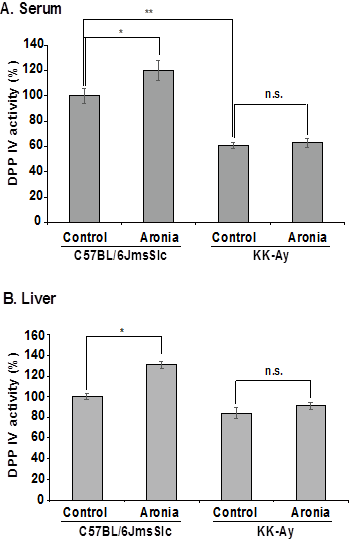 Zhu W, Jia Q, Wang Y, Zhang Y, Xia M. The anthocyanin cyanidin-3-O-β-glucoside, a flavonoid, increases hepatic glutathione synthesis and protects hepatocytes against reactive oxygen species during hyperglycemia: Involvement of a cAMP-PKA-dependent signaling pathway.Free Radic Biol Med. 2012; 52:314-27. Ramesh N, Mortazavi S, Unniappan S.Nesfatin-1 stimulates glucagon-like peptide-1 and glucose-dependent insulinotropic polypeptide secretion from STC-1 cells in vitro.Biochem Biophys Res Commun. 2015; 462:124-30. Hansen L, Deacon CF, Orskov C, Holst JJ. Glucagon-like peptide-1-(7-36)amide is transformed to glucagon-like peptide-1-(9-36)amide by dipeptidyl peptidase IV in the capillaries supplying the L cells of the porcine intestine. Endocrinology. 1999; 140:5356-63. Holst JJ. Incretin hormones and the satiation signal.Int J Obes (Lond). 2013; 37:1161-8. Horikawa Y, Enya M, Iizuka K, Chen GY, Kawachi S, Suwa T, Takeda J. Synergistic effect of α-glucosidase inhibitors and dipeptidyl peptidase 4 inhibitor treatment. J Diabetes Investig. 2011; 2:200-3. Jones RB, Vickers SP, Cheetham SC, Headland KR, Mark M, Klein T. Effect of linagliptin, alone and in combination with voglibose or exendin-4, on glucose control in male ZDF rats. Eur J Pharmacol. 2014; 729:59-66.